Ego is 10 years old at the end of February! We would like to say a huge thank you to everyone for our continued sucess over the last 10 years. To celebrate we've got a week long raffle with 10 great main prizes to give away. 1st prize is a package worth over £300, including Cloud 9 original irons rrp £140. On Saturday the 3rd of March we will be having a day of celebrations in the salon, with refreshments, photographers and extra bonus giveaways! 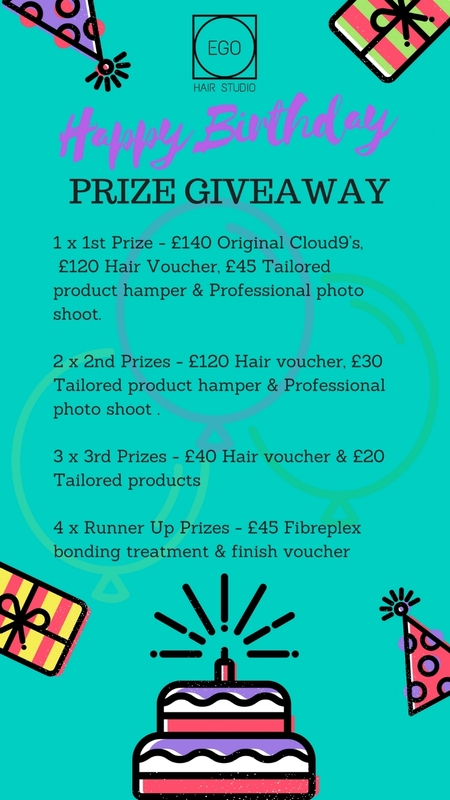 You can make as many entries the price draw as you would like, and you do not have to be a previous Ego Hair Studio client to enter. The dealine for entries both in salon and online will be 12am Sunday 4th March. The winners will be drawn at random live on Facebook once all the entry information has been collated. Keep checking back on social media outlets for updates for when the live prize draw will take place. Details of prize collections, hair voucher fine print, and photo shoot dates will all be released to winners after their announcement. This website and its content are copyright of Ego Hair Studio Limited - © EgoHair Studio Limited 2018. All rights reserved.